Philosophy is not only for people with beards. Open Source software neither. Usually he writes about tech. But in this ownCloud philosophy blog post, Emil asks the real questions: Why is ownCloud Open Source software? Is Open Source really for everyone? And how can it save democracy? Open Source, DIY culture, science – all of those want to liberate humanity through knowledge. So many problems could be solved, if humans shared their skills and ideas, instead of enclosing them in intellectual property. Since I left the Pirate Party, I did not find a better idea to follow. ownCloud put a lot of work in the development of open source technology. I hope that it benefits everybody – not only Europeans, not only those who pay us for it, not only ourselves. The community translates ownCloud into 103 languages. 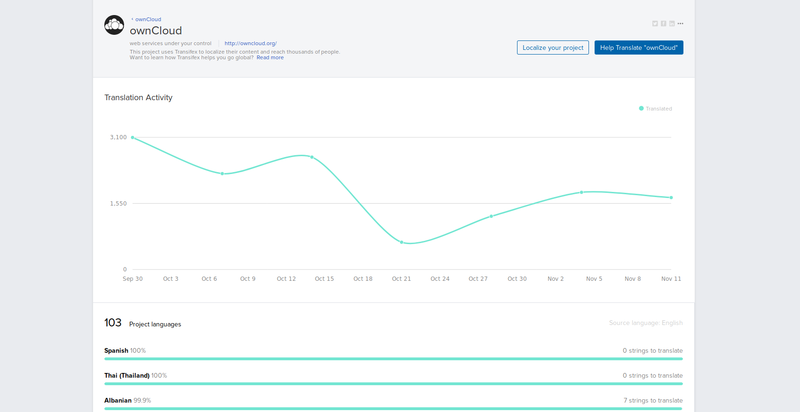 The translation of open source projects is an ongoing community effort. 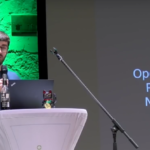 But what is the background of the Open Source movement? What do we hope for? What kind of world do we want to build? To understand the ideological context of Open Source software, we have to look a bit into the history of philosophy. It’s not long, don’t worry. What Exactly Is the Enlightenment? Knowledge and technology are neutral in the sense that everyone can use them. For better or for worse, as Adorno and Horkheimer showed in Dialectic of Enlightenment. The two philosophers take 34 pages to define Enlightenment with a lot of interesting connotations. The definition in itself is interesting to read and blew my mind. To make it short: Enlightenment is the advance of knowledge, giving humans technology to master nature and solve problems. 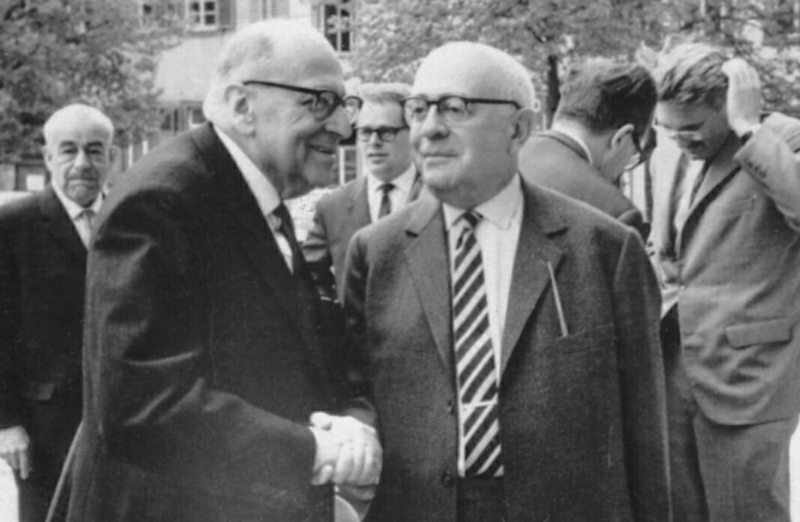 Adorno and Horkheimer 1965 in Heidelberg. Through history, Enlightenment progresses, because humanity has built very useful tools to gain knowledge – I’m proud to say ownCloud is one of them. Through organization of data, we can make the world easier to understand. When we share ideas (basically files), we open a window into the mind of someone else – maybe they find solutions to our problems. The Internet accelerated this process. After almost 50 years of Internet, it is hard to say whether the acceleration was good for humanity or not. 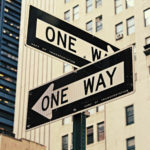 Certain is only: it is much easier for everyone now to make up their mind and construct a world view, find a good explanation for everything that happens. This means a lot of chaos and loss of control – or, as some say, decentralization. Even before the Internet, there has never been centralized control about knowledge. No state can dictate what I believe. Of course we all influence each other – but whether others believe what I say is on them. Everyone has to invent their world view themselves. There is a public opinion, even if it’s produced by very few people. Before the Internet erased the gatekeepers, freedom of speech was the freedom of a few thousand chief editors. Now everyone can express their opinion online. This is not normal for humanity. While I do not remember the time before the Internet, still I’m used to a certain common ground what is considered true and what not. And it is hard for society to cope with this loss of common ground. Since the Internet made these gatekeepers disappear, everyone is responsible for their own world view. This is hard, especially for those who did not learn digital literacy, fact checking, or comparison of sources in school. 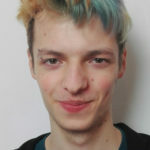 Is Reality my Problem Now? Problem: if people are not capable of judging the truth of facts themselves, fake news spread. Filter bubbles always existed. But now bubbles are bigger than in the old times, and we become aware of what the people in other bubbles believe. This was not a problem as long as those people had no power. But in a democracy, it becomes increasingly dangerous if people have wrong assumptions about reality. Of course no one can be sure that they have the correct world view – but questioning what you believe and testing your assumptions with data is a good start. As citizens, we all have influence on political decision making. Even if it is very small. It’s suddenly important that more people test their assumptions and take responsibility for their world view. We see how democratic decisions become worse, when more people have an outdated or wrong world view. This is a problem for our democracies – and for Enlightenment as a whole. Come on, There Must Be a Tool to Solve This! Tech people love two things about Enlightenment: First, that it creates tools to solve our problems – second, that those tools create new problems we can solve. Let’s assume for this post that technology solves more problems than it creates. That’s the hope of Enlightenment. One problem is the accessibility to technology: not everyone is able to use these tools. Many people can’t read, for example (about 16% worldwide). This makes it hard to use science or computers. Science is open to everyone only in theory – in the West, there are usually free public schools. University is already pretty closed – usually it’s only open for people who have a document with the correct random numbers on it (a bit like a cryptographic key). Even with a degree, it’s still expensive. But many people don’t learn at all how to find out the truth of facts and formulate a world view – and may not even think that it is important for them. This is bad for Enlightenment and the hope that more minds think of better ideas. People need some basic knowledge, if they want to use open knowledge. You need to be able to read so you can use wikipedia or read scientific journals. You need to be able to code to understand how the software you use works. Humanity built a universal tool to access knowledge and interconnected them so they can share information. But not everyone can afford a computer. And many people who have the basic knowledge don’t have the time to contribute to science and open source. We have an education and a resource problem. This lack of accessibility is a tragedy. The literacy map above is a map of unused potential. Every person who does not have a computer, the time, or the knowledge how to use it, is a lost chance. If we want to keep or even improve democracy, we need to make autonomous knowledge gaining easier. The collective energy which makes open source software possible, which drives science, has to be used for democracy. We need more people to use their skills for the common good, and use it for good solutions. Those people are an investment, and our society should make it. The obvious return is creativity – and when their needs are taken care of, all these people can contribute to a stable future for everyone. The public education which offers these chances is a lot of effort, but democracies can hopefully pay for it. All those taxes have to be good for something, right? Let’s reinvest it into people. 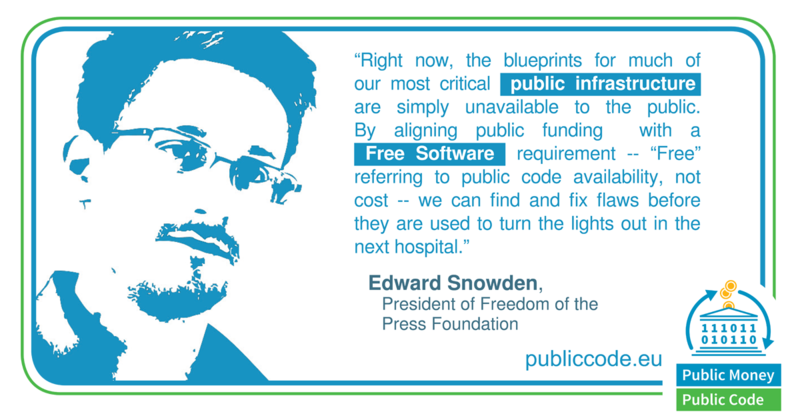 The intiative “public money, public code” fights for open sourcing software which was funded by the public. Public money needs to go into public code, too. It does not make much sense to fund proprietary solutions with tax money. The money is collected from everyone, the results should be available to everyone, too. Not only because it’s fair, also because we can’t trust proprietary software with the responsibility of executing government tasks. The executive of a democracy needs to be accountable, and the software of our government is part of it. It has the obvious advantage that financing open source technology becomes easier. ownCloud has a very balanced business model, which keeps the project stable; but for a pdf reader or an educational video game it would not work in the same way. Let the public fund what belongs to the public. The software we use influences our knowledge organization, our profiles and identities, our private data, our daily lives. We should be able to understand it. If enough people are aware how data defines their lives, they can take control of their lives and improve society. Open knowledge is infrastructure: it works in the background, it’s a foundation. You don’t need to ask if you can use it. And when you create the infrastructure, you can’t predict what the users will do with it. Science, Open Source, open knowledge – they are an infrastructure for unpredictable creativity. To support and maintain this infrastructure, our democracies should pay for internet access and means of electronic production, if someone can not afford it. Until all are free, no one is free – if free knowledge is not free for everyone, it is not free at all. The capability to learn and build your world view is not only a human right and should be guaranteed. It will also improve the quality of our democracies if everyone can participate. What do you think about this? Question my view in the comments or share the post!